Home » Uncategorized » Telepathy, possibly? Imagine a world where our thoughts could be instantly transmitted to machines, computers and other people’s brains. One important application of thought transmission would be creating sophisticated neuroprosthetics for people with a variety of disorders, a goal that has sparked exciting research that aims to connect brains with machines, computers (BMI/BCI) and other brains (brain-to-brain interfacing, BTBI). Large-scale BTBI would allow professors to broadcast lectures telepathically, doctors to communicate with patients unable to speak, and dog lovers to know how their pets really feel. While obviously very exciting, it’s hard not to wonder if this level of connectivity is always desirable. If our thoughts are instantly transmittable and available, would there be such a thing as privacy? Telepathy isn’t distant science fiction anymore. 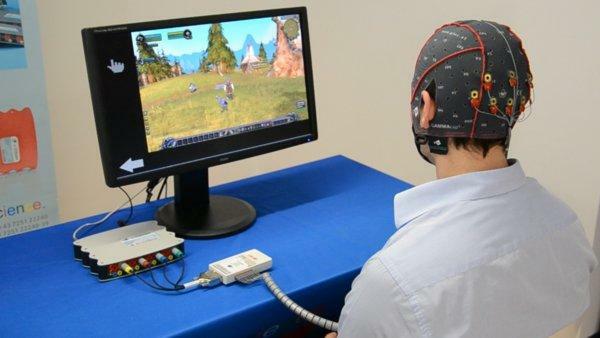 The fields of BMI/BCI have had great successes using neural signals recorded from someone’s brain to do things from operating mechanical arms to playing video games. Applications of this research can be seen in cochlear implants and prosthetic limbs, and has started to blur the line between humans and computers. Ethical questions have also arisen as research and technologies progress. What if your personality changes when your mind is connected to a computer? Would you or your prosthetic limb be responsible if any harm is done to others? BTBI is a related but younger avenue of research concerned with whether the neural signals recorded from one brain can be transmitted not to a machine or computer, but to another brain. Could that second brain use, or at least learn to use, the information contained in the first brain’s neural signals? Research suggests that it can, meaning the second organism’s brain processes and subsequent decisions are changed by the first organism. This obviously even further complicates issues of accountability and responsibility. Recently, several groups of neuroscientists have had success transferring information from one human or rodent brain to a second human or rodent brain. The design of these experiments generally involve one organism outfitted with a BCI, meaning it’s neural signals are extracted and sent to a computer. 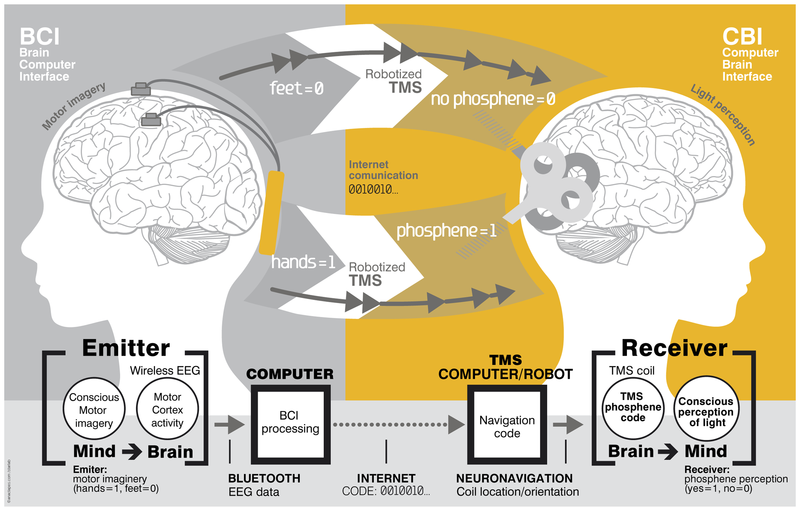 This computer then sends information about those neural signals to the second organism, which is outfitted with a computer-to-brain interface (CBI). The end result is BTBI, where computers (and math!) are essentially translating the neural “language” of the first brain into something the second brain can easily understand. In 2013, a lab at Duke University created a BTBI where neural activity recorded from the motor cortex of “encoder” rats was used to stimulate the motor cortex of “decoder” rats while they decided which of two levers to press. More specifically, the encoder rats were cued to the left or right side of a chamber (red dot in diagram), and pressed the matching lever (watch them here). Their neural activity during this decision determined the intensity with which the decoder rat’s motor cortex was stimulated. Since the decoder rat was cued to both sides (red dots in diagram), it only had the stimulation derived from the encoder rat’s brain to guide their choice. The decoder rat did indeed perform (modestly) better while it’s brain was linked to the encoder rat’s brain, indicating the BTBI was effective (see graph). To show the rats weren’t secretly sharing information through subtle scents or sounds, the authors put an encoder rat in Natal, Brazil and the decoder in Durham, USA and found the same enhanced performance. Excitingly, later in 2013 another research group used real-time BTBI to transfer simple short term memories between rats. The use of BTBI in a memory paradigm instead of a motor paradigm is exciting, and brings up many possibilities concerning memory enhancement and prosthetics. In fact, the authors state that their study “provides the basis for utilizing extracted appropriate neural information from one brain to induce, recover, or enhance memory related processing in the brain of another subject”. This possibility is exhilarating and chilling at the same time; while it would be an amazing advancement in Alziehmers and PTSD treatment, do you in some sense become someone else if you receive their memories? Although memory transfer between humans has yet to be implemented, agencies like DARPA are very interested in these technologies, meaning some complicated discussions are on the horizon. At the University of Washington, participants cooperatively played a video game using this general protocol (watch the researchers do the experiment). The video game required participants to defend a city from an enemy rocket by firing a cannon on the 50% of trials in which the enemy (a pirate ship) appeared. The “sender” saw the game on a computer screen but could not control the cannon, while the “receiver” could not see the game, but could fire the cannon. To fire a rocket the “sender” imagined moving their right hand (step 1), and the amount of mu rhythm activity measured from their brain (step 2) moved the white cursor on the left toward the blue circular target. When the white cursor hit the blue circle, the receiver’s motor cortex was stimulated with TMS (steps 3 & 4). This stimulation would cause the receivers hand to click the touch-pad, thus firing the cannon. The really cool part is that the duos had to be fast – the cannon had to be fired before the rocket hit the city. A group in Barcelona used a similar set up to transmit short words, although their experiment was not performed in real-time (meaning the “senders” activity was recorded ahead of time and then used for multiple “receivers”). Although the types of BTBI in both of these experiments are simple, they were the first to show that BTBI between humans can be achieved by recording and stimulating non-invasively. While the achievements described here have important implications for neuroprosthetic development and our understanding of how the brain works, they have limits. First, the systems are expensive and require highly specialized knowledge to set up. Because of this, few BTBI studies have all the necessary control groups to be satisfying and comprehensive. Additionally, the rate of information transmission in the human BTBI experiments was exceedingly slow, meaning BTBI systems need a lot of optimization before they’ll be widely adopted. 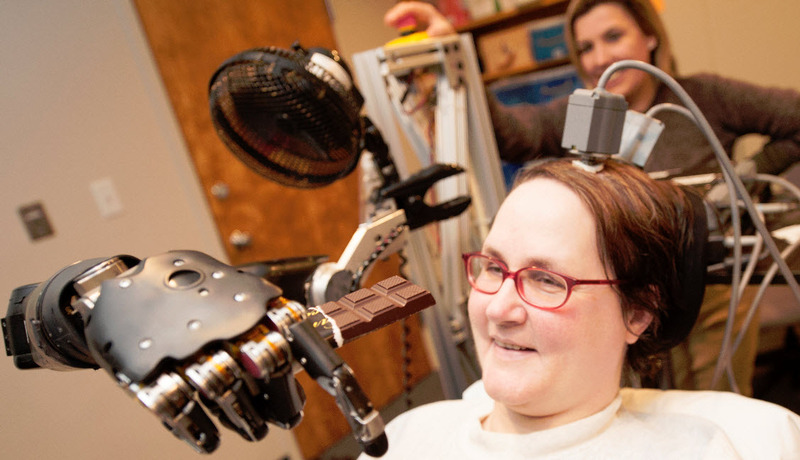 Finally, these experiments require EEG and TMS, which researchers are working to make less clunky and wireless, but are admittedly not quite there yet. Even given these caveats, the number of groups that have implemented BTBI to complete a variety of tasks make it clear that BTBIs are here to stay. Furthermore, with the pace of technological advancement, recording and computing should soon allow fast, wireless noninvasive BTBI, meaning telepathy through BTBI won’t remain futuristic for long. So maybe it’s time to start thinking about how the potential uses of BTBI, and other technologies on the horizon, will change our concepts of ownership and personal agency. What if instead of launching cannons in a video game, BTBI was used by the military to relay information from agents on the ground (the “sender”) to a missile deployer (the “receiver”). If a missile is launched erroneously, is the sender or receiver of the brain waves responsible? Was the receiver acting and thinking as themselves? Did they have free will? These are questions we will be addressing in the not so distant future. The Emory University Study: Deadwyler, S. A., Berger, T. W., Sweatt, A. J., Song, D., Chan, R. H., Opris, I., Gerhardt, G.A., Marmarelis, V. Z., & Hampson, R. E. (2013). Donor/recipient enhancement of memory in rat hippocampus. Frontiers in systems neuroscience, 7.